The readings for the Seventh Week continue to explore Jesus’ teaching in the Sermon on the Mount. The First Reading, from Leviticus 19, recalls that fact that ancient Israel was called to be a holy people because God dwelled among them. The Book of Exodus ends with the completion and dedication of the Tabernacle in the Wilderness of Sinai. 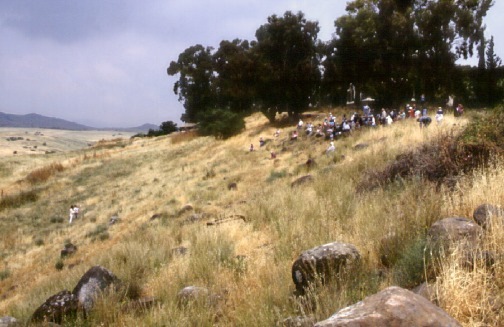 God’s presence inhabits the Tabernacle, in the center of the Israelite camp. From one perspective, the Book of Leviticus (most folks’ least favorite book of the Bible, although the one on which I wrote my dissertation) can be understood as a collection of laws to teach Israel how to live in the holy presence of their God. If the ancient people of Israel were called to be holy because God’s sanctuary was in their midst, the Second Reading from 1 Cor 3 stresses that Christians must be holy because they are themselves God’s sanctuary! and that the Spirit of God dwells in you? for the temple of God, which you are, is holy. In the Gospel (Matt 5:38-48), Jesus stresses that following the Old Testament standards of justice to the letter is still not sufficient to reach God’s perfection. The Law of Moses had limited actions of revenge: one could inflict in retribution no more than the injury unjustly received (“an eye for an eye ...”). This standard of justice was an advance over disproportionate infliction of revenge in tribal society, but Jesus insists that it falls short of divine perfection. My understanding of this exhortation to perfection has changed considerably over the years, as I moved from being an ardent Calvinist to entering the Catholic Church. As a Calvinist pastor, I regarded Jesus’ exhortation to perfection as the setting of an absurdly high moral bar. Jesus did not intend for us to actually be perfect, which was impossible—rather, he was setting an unattainable moral standard that would cause us to despair of ever being saved through our behavior. Then, in despair and desparation, we would seek salvation in Christ by faith alone, rather than works. This was the “First Use of the Law” in Calvinist theology. By "exhibiting the righteousness of God, — in other words, the righteousness which alone is acceptable to God, — [the Law] admonishes every one of his own unrighteousness, certiorates, convicts, and finally condemns him" (Institutes of the Christian Religion, 2.7.6). So the admonition to perfection only served to show us how sinful we are, so we give up trying to be perfect and seek salvation only by faith. I view this verse quite differently today. I now believe that Jesus meant the plain sense of what he said. It is really necessary for us to strive for perfection, and it is possible by God’s grace given to us through the faithful reception of the sacraments. Through the sacraments, God gives us his own power, which enables us to do what we could not otherwise accomplish. "Be holy, because I, the Lord, am holy." "Be perfect, for your Father in Heaven is perfect." Can't see how the Calvinistic notion of faith works there. How do you understand the fresh and bold teaching of Jesus to "turn the other cheek" in light of what is called "legitimate self-defense"? "The Law" seems to have several layers/meanings in Sacred Scripture. Jesus came not to abolish, but to fulfill "the law". "You have heard that it was said...but now I say to you" implies that the old "law" was imperfect. There are ceremonial and moral "laws." There is the "law" of God in which the Psalmist rejoices. There are the "laws" that enslave us according to Paul, the laws we are no longer under (in contrast to grace). There are the laws that do not save us. How do we distinguish among all the different types of LAW in Scripture? I think the answer is crucial for a proper soteriology. It seems to me that in the Sermon on the Mount, Jesus is certainly not excusing us from following the moral law. Rather, as you pointed out, He is giving us the grace not only to do the moral law but to go above and beyond what was prescribed in the OT, when we live as perfect children of God. I have always wondered why this perfection, this superior living, is not evident in many more people in the Church like it was in Mother Teresa, JPII, St. Therese, etc. (...) it appears that Francis de Sales was given to the Church by God for a very special mission. His task was to give the lie to a prejudice which in his lifetime was deeply rooted and has not been destroyed even today, that the ideal of genuine sanctity held up for our imitation by the Church is impossible of attainment or, at best, is so difficult that it surpasses the capabilities of the great majority of the faithful and is, therefore, to be thought of as the exclusive possession of a few great souls. St. Francis likewise disproved the false idea that holiness was so hedged around by annoyances and hardships that it is inadaptable to a life lived outside cloister walls. @Louis: That's a great point about turning the other cheek. What does this require us to do? I think it is relevant that the examples Jesus uses are of non-lethal offenses. The striking of the cheek was not attempted murder--it was primarily an insult in antiquity. To turn the cheek is to accept the insult without retaliation. Likewise, the other examples Jesus gives are of impositions on one's wealth or person, but not of attempts on one's life. For this and other reasons, the Church has not understood Jesus' teaching to be forbidding self-defense. I think it would have been different if Our Lord had said, "If someone comes at you with a sword, let him run you through ...", for example. Sirach as Scripture in Judaism? What is the Biblical Form of Church Government? Join Us In Lubbock, TX This Weekend! What is the Pillar and Bullwark of the Truth?